COLUMBIA, S.C. – Fresh off the its first 2-0 start to SEC play since 2008, the South Carolina volleyball team heads on the road for a pair of matches this weekend. The Gamecocks travel to Alabama on Friday for a 8 p.m. ET first serve, then move on to Athens for a 2 p.m. match against Georgia on Sunday. Both matches will air on the SEC Network+ online stream. Alabama has been the breakout team of the SEC through the season’s first five weeks, as the Crimson Tide sit at 13-2 overall and 1-1 in conference play after being picked to finish 12thin the preseason coaches poll. A big reason for the team’s success has been the wide array of options in the attack. Ginger Perinar leads the team with 3.39 kills per set, but Doris Carter (3.13 k/s), Hayley McSparin (2.30) and Mahalia Swink (2.09) are close behind. The team also ranks third in the SEC in blocks (2.44 per set) and leads the conference with 15.30 digs per set. The teams split the two meetings in 2017, with the home team winning both times. 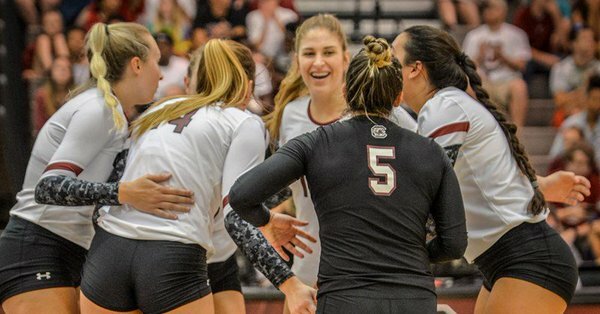 After losing in five sets at Alabama, the Gamecocks rallied from a first-set loss to win in four sets at home on Nov. 17. Mikayla Shields led the team with 18 kills and a .366 hitting percentage. The Bulldogs had a marathon first weekend of conference play, going 1-1 with a pair of five-set matches. The team defeated LSU at home Friday, but lost at Texas A&M Sunday afternoon, moving its overall record to 10-3 this season. The team will travel to Ole Miss for a Friday night match before returning to Stegeman Coliseum Sunday afternoon. The Bulldogs boast the number two offense in the conference, led by standout pin hitters T’ara Ceasar (4.41 kills per set) and Rachel Ritchie (3.47 k/s). Leading the offense is setter Meghan Donovan, who earned back-to-back-to-back SEC Setter of the Week honors and leads the SEC with 11.31 assists per set. Defensively, libero Kendall Glover ranks second in the conference with 4.56 digs per set, and opponents are hitting just .183 overall. The Gamecocks lost in five at home to Georgia on Oct. 6, hitting only .082 as a team and committing 23 unforced attack errors. The team rallied from a 2-1 deficit to force a fifth set, but could not pull off the comeback. This is the first time since 2008 that the Gamecocks started the SEC season with a 2-0 record. Thanks to her match-high 13 kills against Miss. State, Mikayla Shields passed Belita Salters (2004-08) for fifth place in kills for the rally-scoring era. The 13 kills for Shields were also the most by any Gamecock in a three-set match so far this season. The team finished with 47 digs against the Bulldogs, also a season high for a three-set match. Ezell (15) and Koehler (10) finished in double-digits, and three other Gamecocks had five or more digs. With her six assists in the match, Ezell moved into the program’s all-time top 10 for career assists. Now with 2,044, she passed Iris Santos (2003-06) on the list. The Gamecocks are now 34-13 in the all-time series with Mississippi State; Friday night’s win breaks a three-game winning streak by the road team in the series. After Sunday’s win, South Carolina has taken three of the last four meetings with LSU, after the Tigers won the previous five straight matches. LSU finished the match with a .103 hitting percentage. It’s the third-straight match holding opponents under .150, and the seventh time over the last eight matches. Claire Edwards’ three solo blocks against LSU tied a career high for the junior middle, and moved her into the program’s top 10 for career solo blocks in the rally-scoring era. Now with 30, she needs just two more this season to move up to seventh. South Carolina’s 3-0 sweep of Clemson on Aug. 25 was the 800th victory in the program’s history. Along the way, the team has 17 season with 20 wins or more and seven appearances in the NCAA tournament. Tom Mendoza became the 13th head coach in Gamecock volleyball’s 46-year history on Jan. 3, 2018. Mendoza came to Columbia after two seasons as head coach at High Point University, where he led the Panthers to back-to-back NCAA tournament appearances. In 2017, the Panthers were in rare company as a mid-major program earning an at-large bid to the NCAA tournament. In the postseason, Mendoza was named the Big South’s and AVCA Southeast Region’s Coach of the Year. Before taking over at High Point, Mendoza helped lay the foundation for one of the top indoor program in the country, at Creighton. During his six years there, Mendoza helped the program win five conference titles, five NCAA Tournament bids and a berth in the NCAA Sweet 16 in 2015. Senior libero Aubrey Ezell has at least three aces in nine of the team’s first 12 matches, and is now ranks fifth in the program’s all-time history. She currently ranks second nationally with 1.00 aces per set, and is the NCAA active career leader. Last season, Mikayla Shields became the third sophomore in the program’s 45-year history to make it to 700 career kills, joining all-time kills leader Lori Rowe (in 1984), and current associate head coach Shonda Cole (in 2004). In Sunday’s win over LSU, Shields moved past 900 career kills, making her the seventh Gamecock in program history to make 900 kills in three seasons (despite having 16 matches left to play). Junior Britt McLean arrived in Columbia this summer after two seasons with Minnesota. She played in nine matches in her two years with the Gophers, but ended 2017 on a high note, playing every set of their three NCAA tournament matches. Sophomore Jess Vastine saw considerable playing time as a freshman at Carolina, but was relegated to a largely back-row role. The duo has already given a facelift to one of South Carolina’s biggest weaknesses in 2017 – consistent offensive numbers from the left side attack. McLean and Vastine’s combined numbers (4.52 kills per set, .199 hit percentage) compare favorably to the combined numbers of the Gamecocks’ four main left side hitters from 2017 (5.54 k/s, .153 hit percentage). Aubrey Ezell is on an impressive streak for the Gamecocks. The senior has not missed a single set in her career, entering Friday on a stretch of 103 matches played. Currently, her 378 total sets ranks 10thin the rally-scoring era, but no other player has played as many consecutively. Joining first-year head coach Tom Mendoza and fourth-year assistant coach Shonda Cole on the bench this fall will be Ethan Pheister, who spent the last three seasons as an assistant at LSU, working with the setters and helping coordinate the offense. “Ethan is the right coach to round out our staff, and contributes to the culture we are working to build in our program. He is an elite trainer and is one of the top minds in our game from a scouting and analysis perspective. More importantly, he identifies well with the student-athletes, and has a teach-first mentality to their development both on and off the court,” Mendoza said. LSU turned itself around in 2017, going from nine wins in the previous season to 20 wins and an at-large bid to the NCAA tournament. Pheisterhad prior experience coaching in the SEC in 2012, helping Arkansas make the national tournament. Britt McLean transferred to South Carolina after two seasons at Minnesota. She comes to the team after ending the 2017 on a high note with the Gophers, playing every set of their three NCAA tournament matches. In the opening round against North Dakota, McLean led the team with 13 kills and a .355 attack percentage in a sweep. In her two seasons at Minnesota, McLean played in nine matches. Aubrey Ezell passed 175 career aces during the team’s win over Mississippi State on Friday, Sept. 21, making her the only player in the program’s 45-year history to reach 2,000 assists, 1,000 digs and 175 aces in a career. The Gamecocks have made the Carolina Volleyball Center one of the toughest venues in the country over the last three seasons. Of the program’s top ten crowds all time in the CVC, nine have come in the last three years and three of the top five have come this season, including a program-record crowd of 3,458 at the Clemson match on Aug. 25. That beat the record set less than 24 hours earlier, when 2,579 watched the team take down ETSU. This season, the Gamecocks rank 14thnationally for cumulative attendance and 19thin average attendance. South Carolina holds an 808-631 (.561) all-time record, dating back to 1973. The team’s 800th win of all time came on Aug. 25, 2018 against Clemson. The Gamecocks joined the SEC for volleyball in 1991, and have an all-time conference record of 187-263 (.415). In matches in the Carolina Volleyball Center, Carolina 196-111 (.638) overall and 97-94 (.507) in SEC matches. Tom Mendoza became the program’s 13th head coach on Jan. 3, 2018. This is his third season overall as a head coach, with a career record of 58-19.